Usually a Mac or a MacBook Pro needs 20-30 seconds to start up. It depends on the certain hardware configuration of a machine. For instance, Macs with SSD disks start up faster that those that have HDD disks. If you don't use SSD now, I recommend you upgrading your hardware. You will be surprised with the speed! Maybe you already use it, for checking this click on the Apple logo, go to 'About this Mac' and choose 'Storage'. Finally, let's get to the post topic! When you notice that your Mac needs 40 seconds or more for starting up, there may be some issues causing that. I've gathered 6 possible issues and solutions for them that will surely improve your Mac's startup time. Some tips and tricks will work for you better than others, as various users have different problems. Anyway, I'll tell about all of them here and hope that you will find a suitable solution for your problem. After upgrading to a new High Sierra macOS version (if you haven't done it yet, upgrade your system now) you may notice that it takes lots of time for your Mac to fully start up and get to the general tasks. In this case, a long startup is an ordinary thing, as some applications such as Photos and Spotlight need to update and re-index the data. How to fix it? Keep your MacBook Pro turned on for 1-2 days (24-48 hours) and reboot it for a few times after that. If you still face a slow startup process, maybe you'll need to enable TRIM. I'll tell you more about it later in my article. How does it help? Applications like Photos and Spotlight need much time for re-indexing all the data stored on your MacBook Pro or Mac. So, Spotlight scans the whole internal HDD and searches for all the files to re-index them. Likewise, the Photos app (or iPhoto, as it was called previously) needs to update the images library too. The process is quite long and needs some time and a plenty of system resources to finish. However, once your MacBook completes re-indexing files and folders, its startup process will become faster, so the performance will boost automatically. If your machine continues to start up very slowly, enable TRIM. This option is good for those who use SSD. The easiest way to do it is to get the TRIM enabler and simply switch it on! Imagine if your Mac was a car and carries lots of heavy items in the trunk. It would speed up to 60 MPH slower. The same we can say about your MacBook Pro. 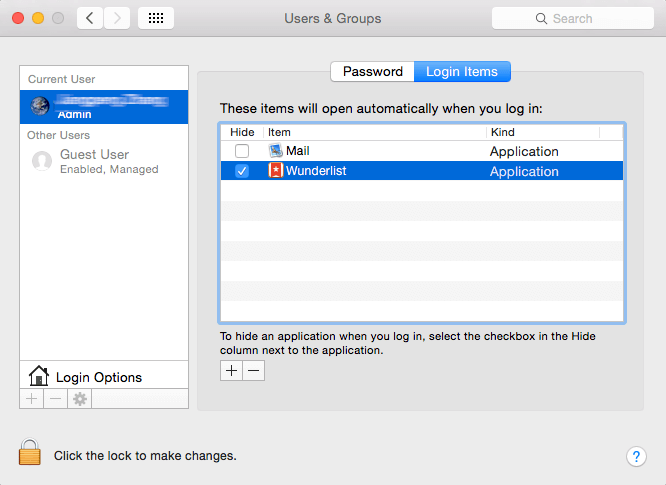 If you have lots of login items, it will start up slow, as all those application will launch automatically one by one, not giving you a chance for the comfortable using your Mac. How to fix it? Delete all the Login items that you don't need. Click Apple's logo in the top left, and go to 'System Preferences'. FInd the 'Users and Groups' line and choose it. Click the 'Login items' tab near 'Password'. You'll find the list of all the services and applications that switch on automatically on your MacBook Pro. Select the checkbox that is situated in the 'Hide' column to disable items you don't need, and click the icon with a minus on it. Having nearly full HDD or SSD is tragic for every user, because it slows down your Mac's performance drastically. Even fast and efficient SSDs are helpless when they are full of data. In this case, your machine will be slow both during the startup process and usual working usage. How to fix it? Clean the Mac's drive and make sure that there is more than 30% of free space now. The most simple way to get rid of unnecessary and outdated files is an application, for example, CleanMyMac X (or MacBooster from IObit, alternatively). They are designed especially for this purpose and can save you a plenty of time. Such software solutions locate third-party apps, junk files from your web browsers, old files and other trash. However, files duplicates can eat free space on your disk. There are software utilities for such situations too. For example, Gemini 2 can find all duplicates and remove them just in a couple of clicks. If you like working with your MacBook Pro manually, I recommend you starting with folders where you store videos and images. Then visit the 'Applications' folder, sort all the apps on last used or modified, and get rid of those you don't use at all. Remember to clean web browsers (Safari, Firefox and Chrome). Clear the histories, caches, extensions. Finally, you can store large weighty files to an external drive of iCloud. This can help to clean your Mac as well. The system files are usually stored on your HDD (or SSD) in a section called 'Macintosh HD'. If this disk has some errors and issues caused by third-party apps or add-ons, the startup process can become slow as well. Sometimes, a machine is unable to boot at all. How to fix it? Verify and repair all the disk permissions. In OS X Yosemite or earlier versions, you are able to use Disk utility. Visit Apple's website to find a guide on how to use it correctly. For MacBooks and Macs with El Capitan or the latest macOS Sierra (or High Sierra), this option is unavailable. Som you will need to learn how to do it with Terminal commands. Apple's website can explain how to do it either. These are the files that store Mac's parameters - they are the rules for applications behaving. If they become broken for some reason (usually it happens due to apps crashes or hard drive issues), your Mac may start up slower that always. How to fix it? Find what files are broken and update them. They can be found in ~/Library/Preferences. Delete them and create new preference files. If your MacBook Pro starts up slowly and works poorly as well, for example, the trackpad has problems, Wi-Fi doesn't connect, battery has issues, maybe your SMC (system management controller) or NVRAM (nonvolatile random-access memory) are the cause for it. How to fix it? Reset NVRAM and SMC. You can find the way of doing that on the official Apple website. Here you are! These are the most common problems and working fixes for them! I hope the article was helpful and you're not facing any problems with starting your MacBook Pro up any more.